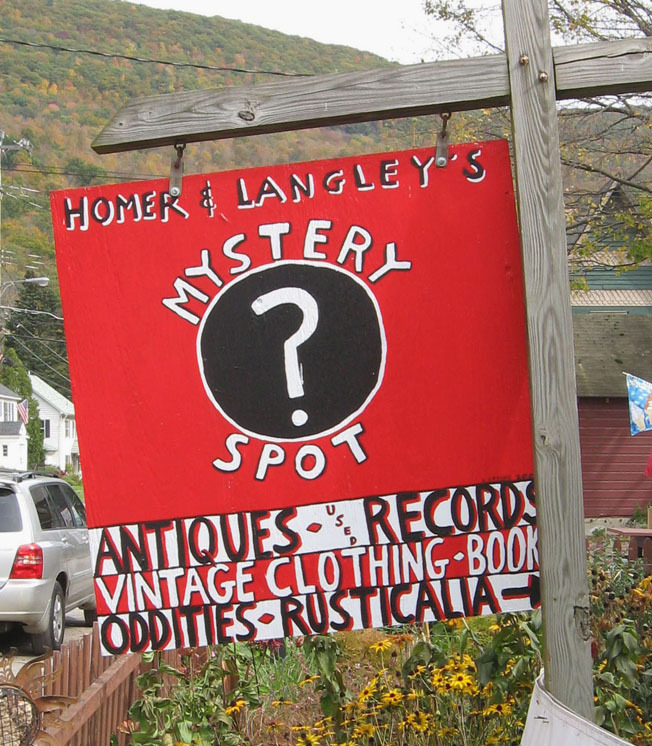 Homer & Langley’s Mystery Spot Antiques, the Catskill’s most unusual vintage odditorum, has become the must-see destination for antiquers, vinyl diggers, treasure hunters, fashion designers, prop stylists, tourists, curiosity seekers – even a famous face or two! 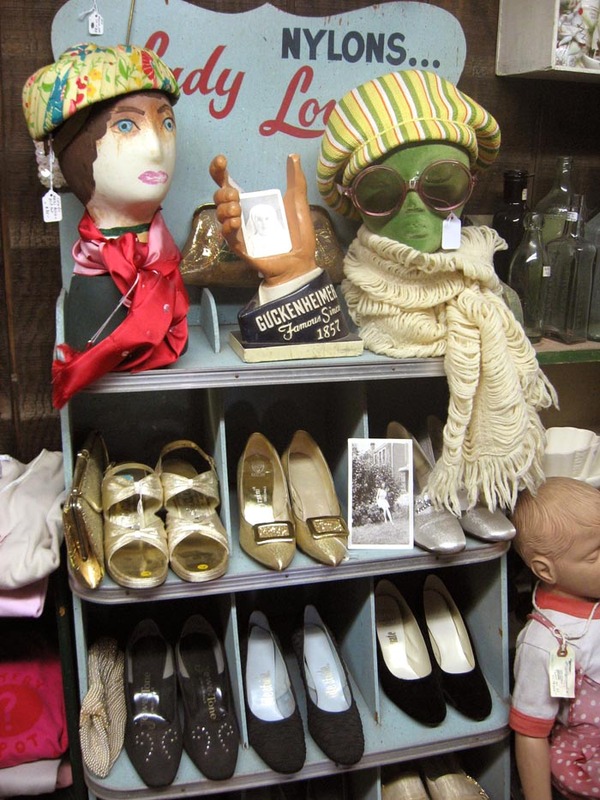 Packed to the rafters with vintage clothing, unusual antiques, collectibles, 1000′s of used records, found objects and downright oddities, The Mystery Spot will amaze and delight! Yes, The Mystery Spot has something for everyone. Primitives, mid-century modern lighting, cookie jars, paint-by-number art, Forties kitchenware, vintage soul 45′s, Fire King dinnerware, salt & pepper shakers, vintage clothing for men, women and children, old clocks, board games, vintage fabric & tablecloths, mod curtains, a roomful of old art books, the chrome corner, garden gnomes, pottery, vintage office supplies, Fifties nylons, rusty tins, and other curiosities. Three rooms carefully stocked with hand-picked vintage clothing, another room devoted to records, another housing Homer’s Books d’Arte. THEN VISIT the SUB-KINGDOM OF PLASTICALIA! 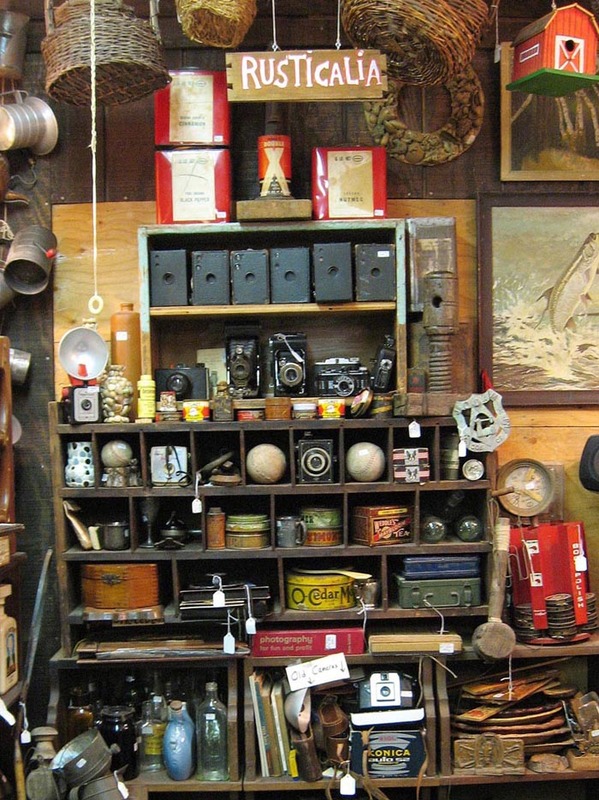 Named for Homer & Langley, the infamous Collyer Brothers (who were tragically crushed under their 136-ton accumulation of “collectibles”), the Mystery Spot is a shrine to clutter. As a child growing up in New York City’s Chinatown/Lower East Side, proprietress Laura Levine still remembers being warned by her mother that she might end up like one of the Collyer Brothers if she didn’t clean up her room. Old cameras, knitting and sewing notions, vintage linens, pole lamps, enamelware, vintage prom dresses, Russel Wright dinnerware, old radios, school primers, 60′s trash tabloids, cocktail shakers, old christmas tree ornaments, black velvet paintings, teapots, early surgical instruments, thousands of record albums, old postcards and photographs, rotary telephones, art glass, mini-dresses, maxi-dresses, Fifties purses, groovy afghans, tiny figurines, and much MUCH more. Having recently acquired a collection of over 15,000 rock, jazz, folk and C&W records (which we’re still sorting through), we can now add “used record store” to our resume. 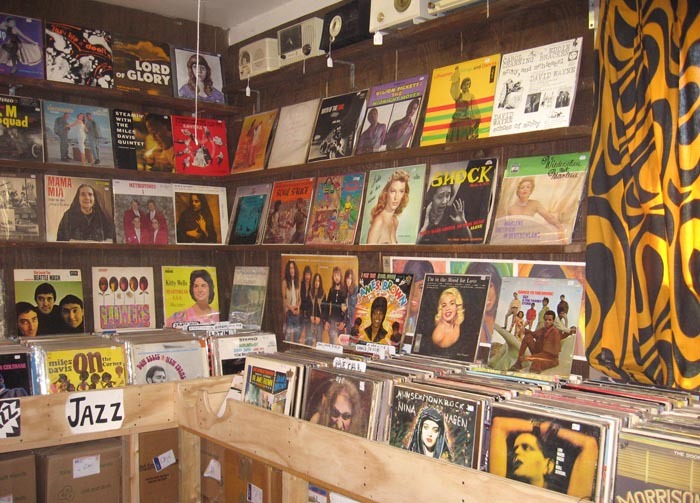 Heck, even when our doors aren’t open, customers are welcome to dig through the dollar record bins and our famous Yard Sale in a Box on the front porch (“Our Lapse in Judgement = Your Treasure!”) with 24 hour honor box/money drop at your service. **********> THIS JUST IN! 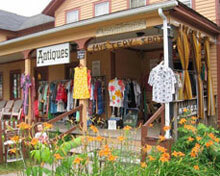 The Mystery Spot is pleased to announce that they have recently moved to Main Street and expanded to seven rooms! Don’t forget to visit our book room, HOMER’S BOOKS D’ARTE. Featuring out of print, used & useful books on the arts — all periods, all media. Painting, sculpture, architecture, photography, design, artists, decorative arts & antiques — plus an assortment of interesting old books in many other fields, hand-picked from Homer’s personal library of over 10,000 volumes. 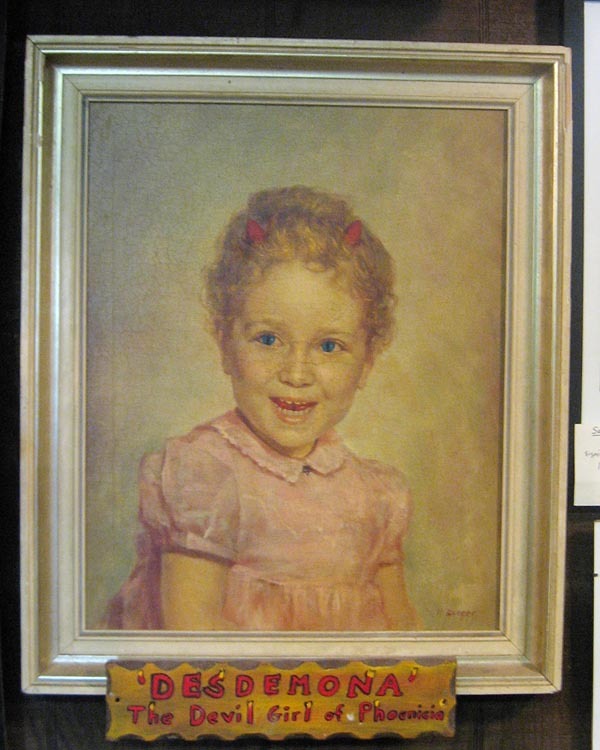 See why Homer & Langley’s Mystery Spot Antiques was named one of the most “Bizarre Attractions of the Catskills” by the Albany Times Union and was rated “SPECTACULAR!” by Ralph Lauren’s Mary Randolph Carter (the world’s foremost authority on junk and the author of “American Junk“). The Mystery Spot is a proud member of the Ulster County Antique Dealers Assn., the New York State Adopt-a-Highway Program, and Club 57. 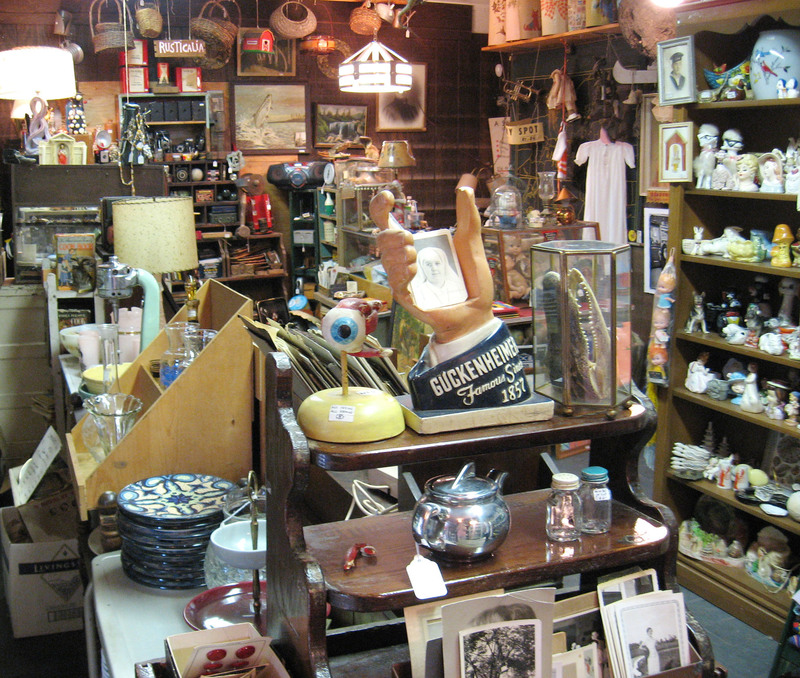 Mystery Spot Antiques also provides prop rental services for films and photo shoots and is available as a film location. Inquiries welcome.